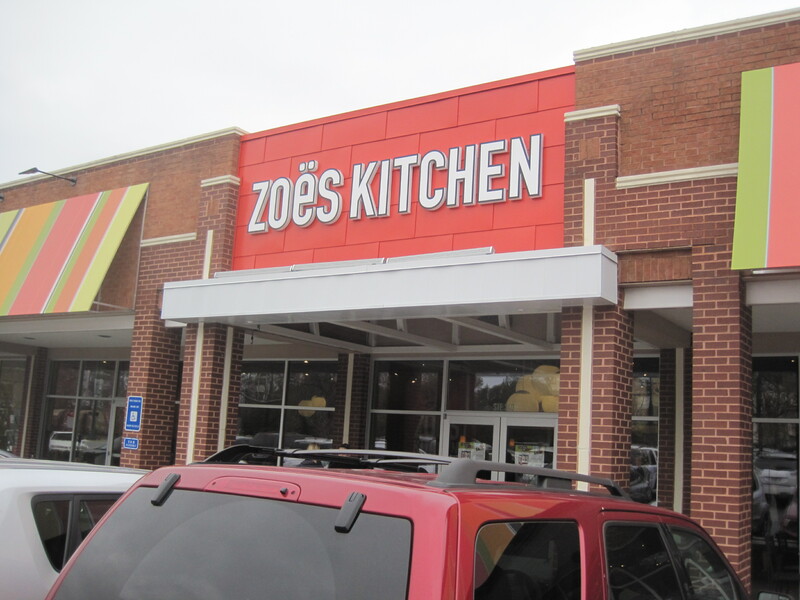 Zoe’s Kitchen calls its cuisine “Mediterranean inspired comfort food”, but arriving at lunch hour peak to the Dunwoody location, you’ll find very little comfort in the dining experience. It is a nightmare dealing with the crush in the parking lot, the crowd in the eatery, the dirt and filth spread by overuse of the facilities, loud out of control children, dirty cramped tables shared with strangers. Since Zoe’s is a chain, I suspect they think making people eat under these conditions is a good thing, but given the alternatives in the area (isn’t Joey D’s Oak Room just across the street? ), you have to ask yourself what kind of masochist you are to even brave Zoe’s. That’s the lunch hour rush view. Step back a bit, let the rush pass, and suddenly, private seating opens up, the efficient staff quickly clean and free space, and you can get a glimpse of what the dining experience could be when the appropriate number of folks are occupying the space. And what it is is a very mixed dining experience. Ambience: First of all, let’s lead by saying the Dunwoody Zoe’s is pretty. It has some nice tables, nice chairs, real plates, real knives and forks. There is plenty of glass with a north side view. The eatery is much wider than it is deep, and for someone wanting some sunlight while they eat a huge bowl of salad, it has plenty of offer. 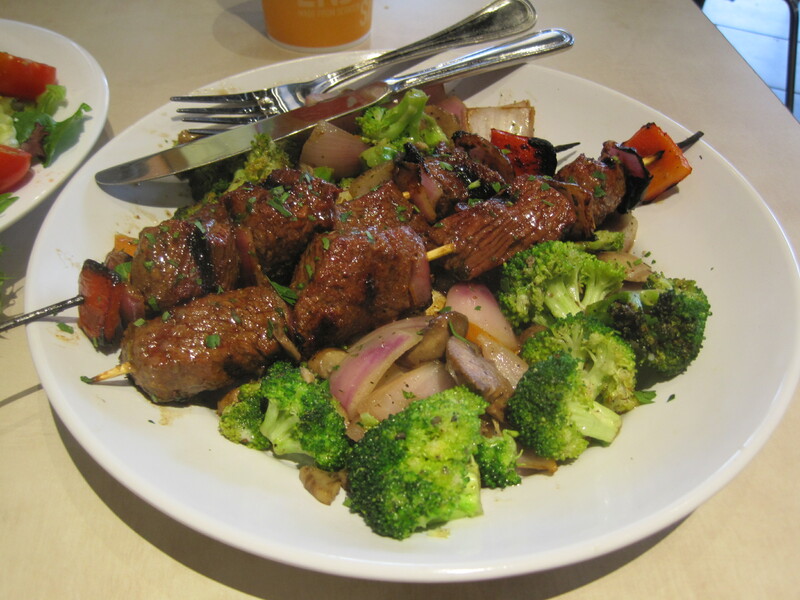 One of the best things about Zoes are the marinated beef kabobs. To the food: I had steak kabobs, grilled vegetables, and a small greek salad. The kabobs were good, with large chunks of tender, tasty marinated beef. Other items on the kabob were lacking, thin slices of vegetables that didn’t really satisfy. The grilled vegetables were a mixed bag, lacking the umami you would expect from a mix containing as many onions and mushrooms as it did. 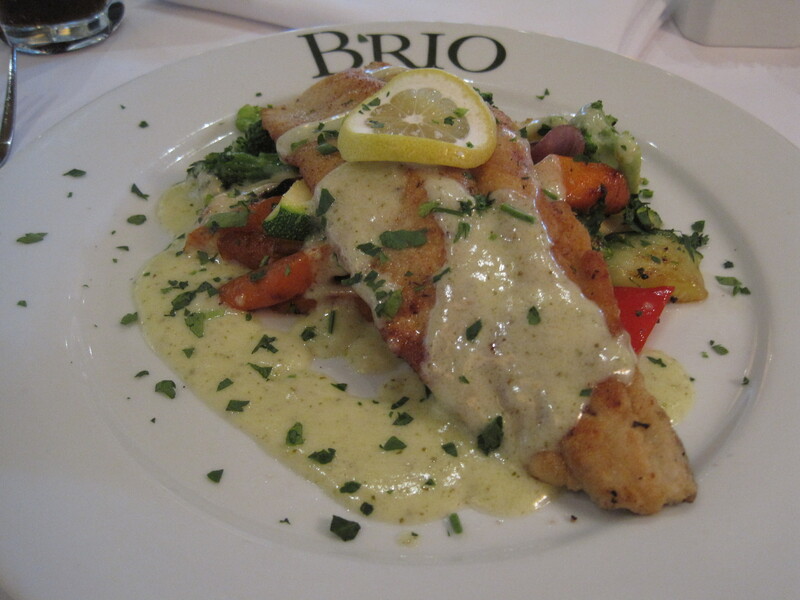 The broccoli seemed undercooked compared to the much softer vegetables in which it was found, and the texture change was jarring. 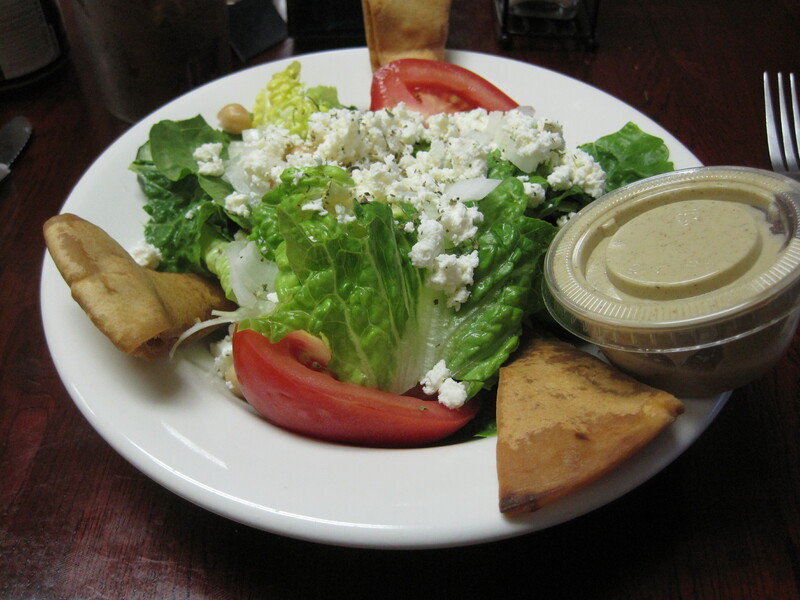 The greek salad was full of tender green leaves, and otherwise, nothing really to speak of. 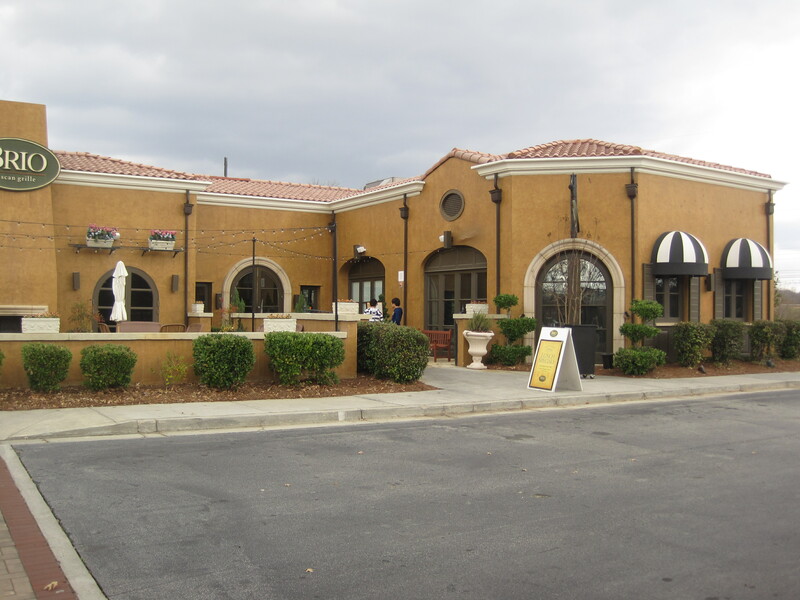 It lacks the flavor you would expect from a more serious attempt at Mediterranean cuisine. If you can avoid the crush, there is some food value in Zoe’s, especially the meats. 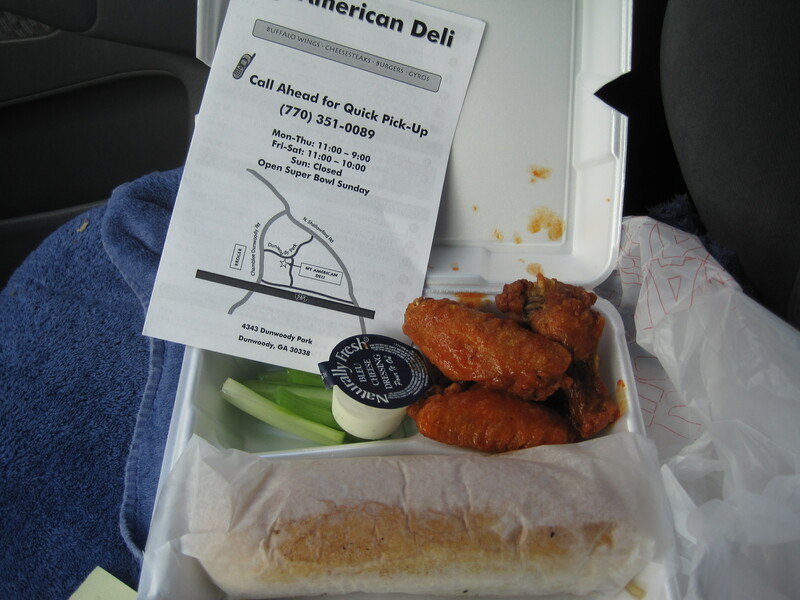 But nothing else about the food quality rises much above fast food levels, and as fast food goes, Zoes is a pricey option. It really isn’t competitive in quality with, say, the filet mignon sandwich that Joey D’s serves next door, and Joey’s is an infinitely more comfortable place to wait. Take home: There is enough virtue in this restaurant to review it. There is not enough virtue to recommend it in a eatery rich environment like the Perimeter Mall area. 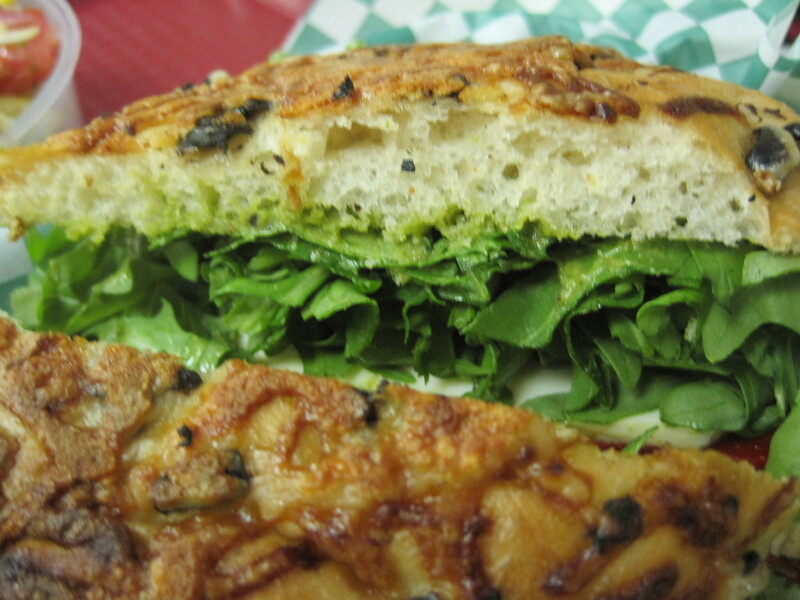 There are a fistful of better dining experiences within two blocks at this price point. If you love kabobs, large servings of fresh, tender, uninspired greens, or the vague hint of ethnicity that Zoes evokes, feel free to go. If one of these appears in a suburban dining hell, there may not be a better, more restful option. 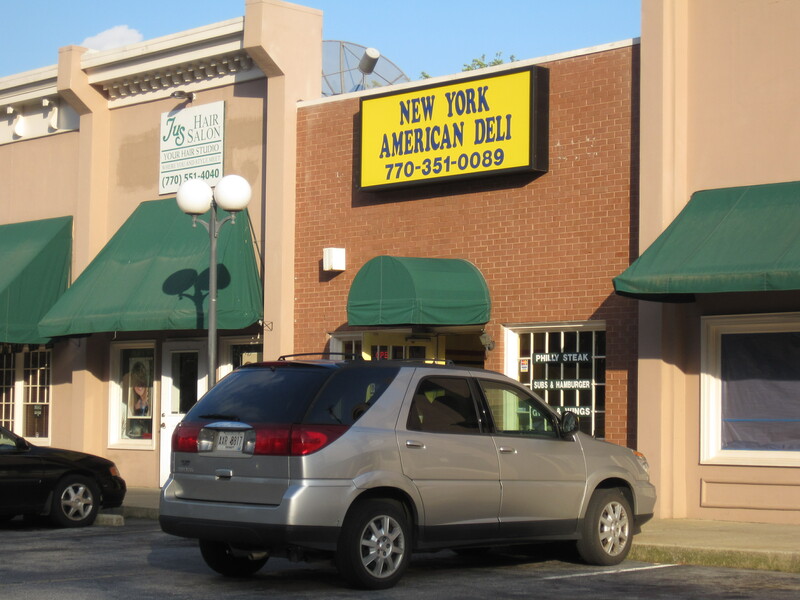 But if you’re in the Perimeter Mall area and considering this restaurant, for heaven’s sake, avoid this place during the lunch rush. On Wednesdays, on the nights where the Atlanta Braves are away, the 680 the Fan crew will be broadcasting from the Firkin and Gryphon. 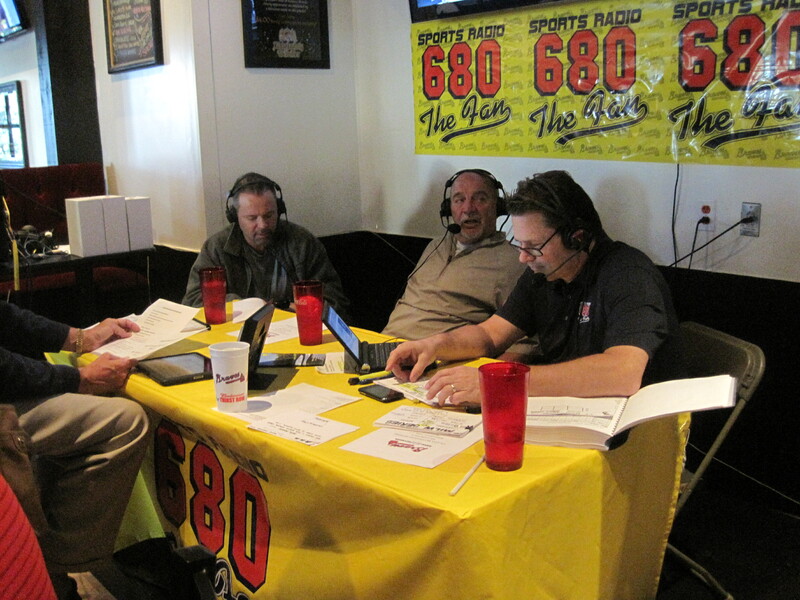 To note, this picture shows Buck Belue, Leo Mazzone, and Mark Lemke during their broadcast. John Kincade left a bit after I arrived, and isn’t in this photograph. In my estimation, the Firkin and Gryphon provides a decent sports bar experience, with food quality better than most, and good to excellent service. If you can combine that with some face time with some of Atlanta’s best radio sports broadcasters, that’s just icing on the cake. Prettier than most sandwiches, plenty of meaty flavor (phoneticized as “Ooo Mommy”), and unearthly bread, yes, this sandwich is a major keeper. 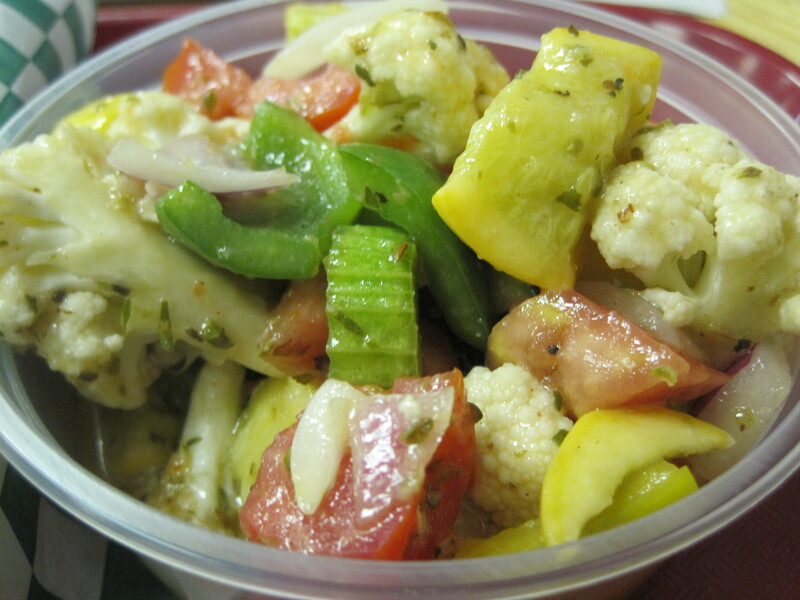 The marinated vegetables here aren’t bad either. 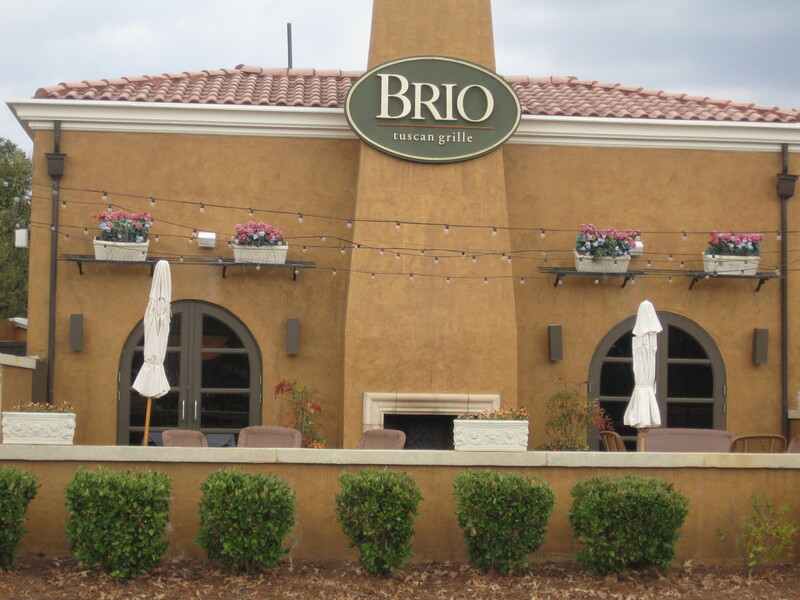 Brio is a pretty restaurant, nestled on the west side of Ashford Dunwoody. It’s almost too pretty for me, but given the hour I chose to eat, and the near total lack of choices around 3pm, I tried this place and was not disappointed. 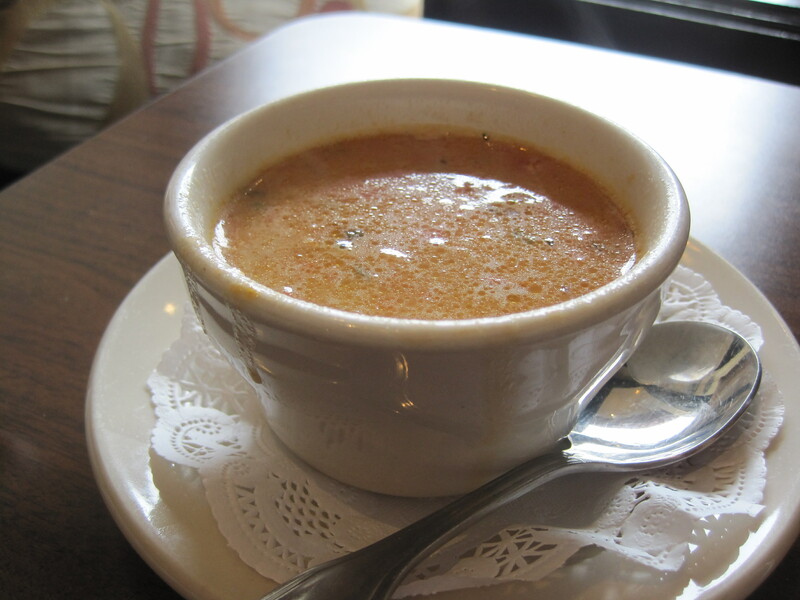 I had a good bowl of bisque and a grilled bit of trout. 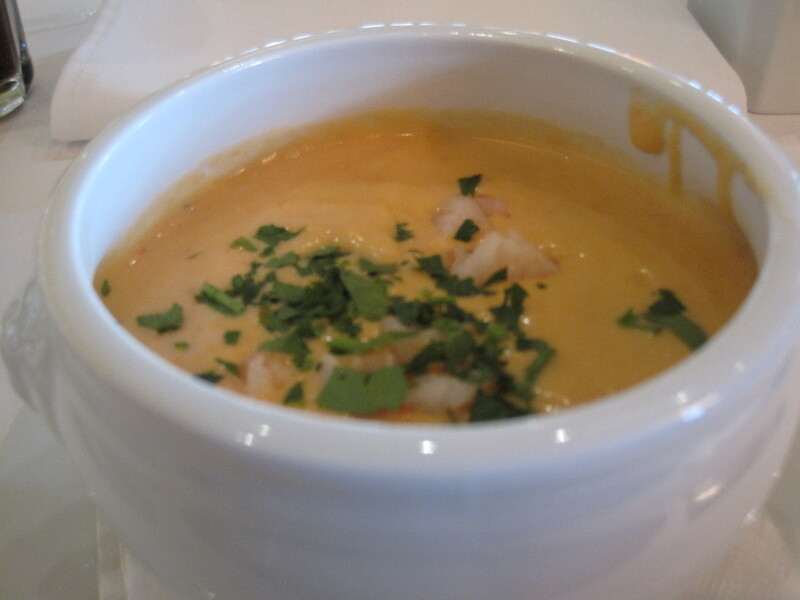 There were real bits of lobster in the creamy bisque and the light sauce on the trout didn’t mask the delicate flavor of the fish. It’s large inside, roomy, dozens of places to sit. The equally large kitchen here is open to view, and the kitchen top is made of marble. Oh yeah, this place is a couple steps above the wings and beer crowd. Service is attentive and superb, staff all in white and sporting ties. Now, fair warning, as I was here during the “off off hours”, my experience isn’t typical of any meal during normal attendance and any kind of rush hour. But the brief impression I had was all good. I’d been looking at this restaurant online perhaps a month or two by now, and this night seemed a nice time to drop by. I ended up ordering a couple dishes, a kabob and a burger, and also a side salad. The salad was good, with small crisps that accompanied it and a tasty light green dressing. 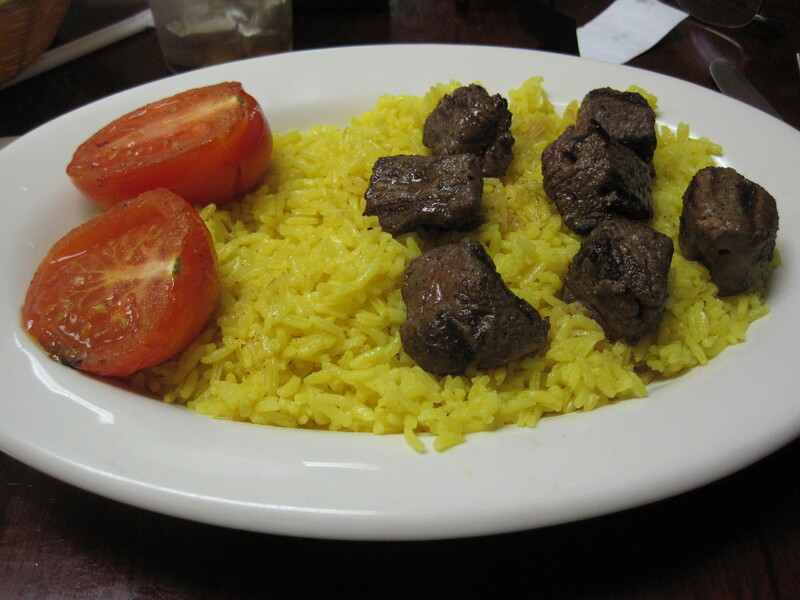 The tomatoes were juicy and flavorful, the meat well seasoned and tasty, the rice largely wasted with me. Unfortunate. The burger was excellent. If this were being served on Howell-Mill Road, people would be arguing about the merits of it. Good bread, and the lamb was neither too rich nor lacking in flavor. 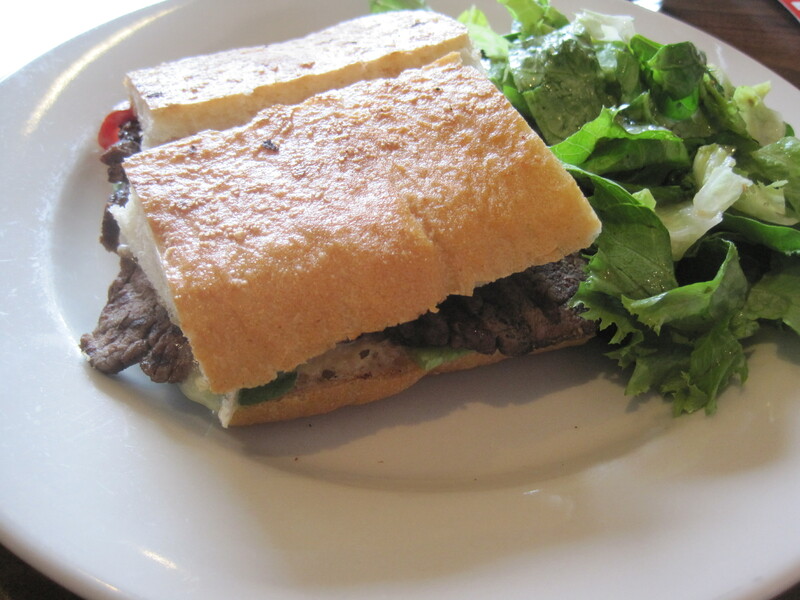 When I asked about it afterwards, Chef Domi said that Cafe Sababa grinds their own lamb. 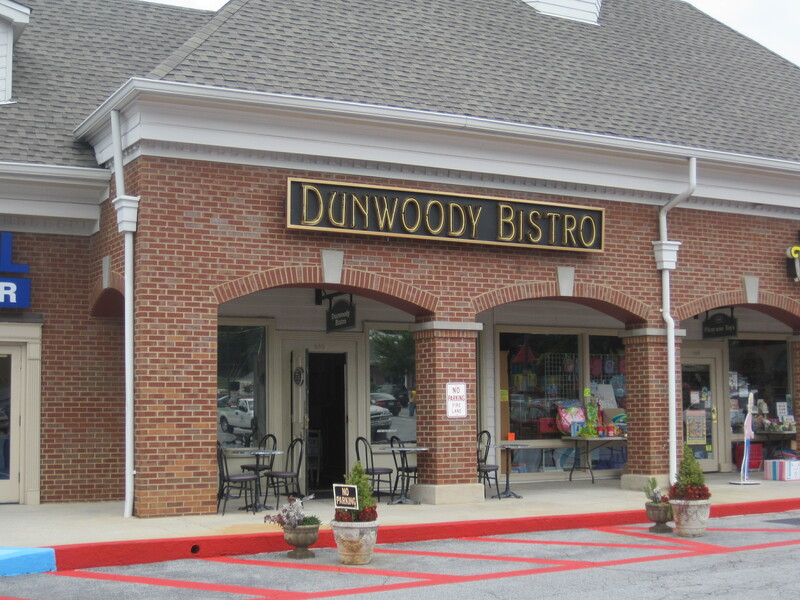 The Dunwoodies have plenty of food choices, and a rich collection of sandwich and burger places. 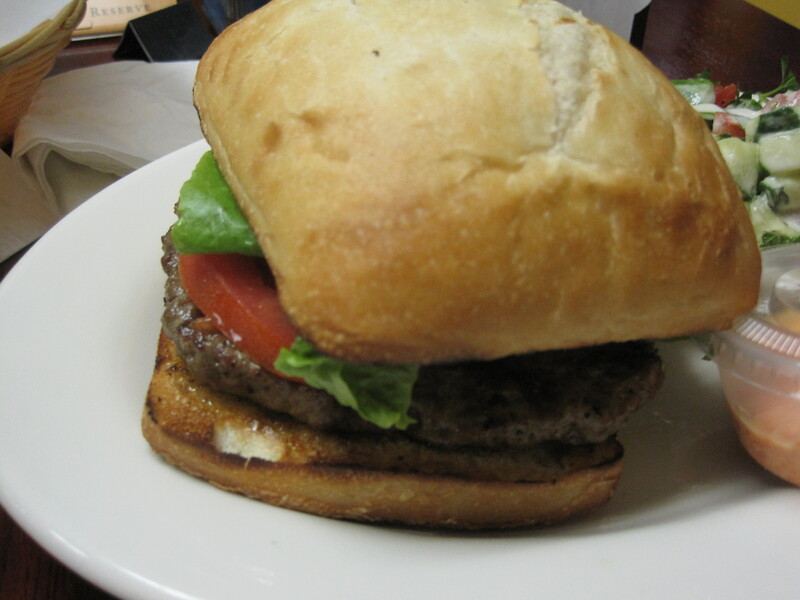 But this burger is worth seeking out. 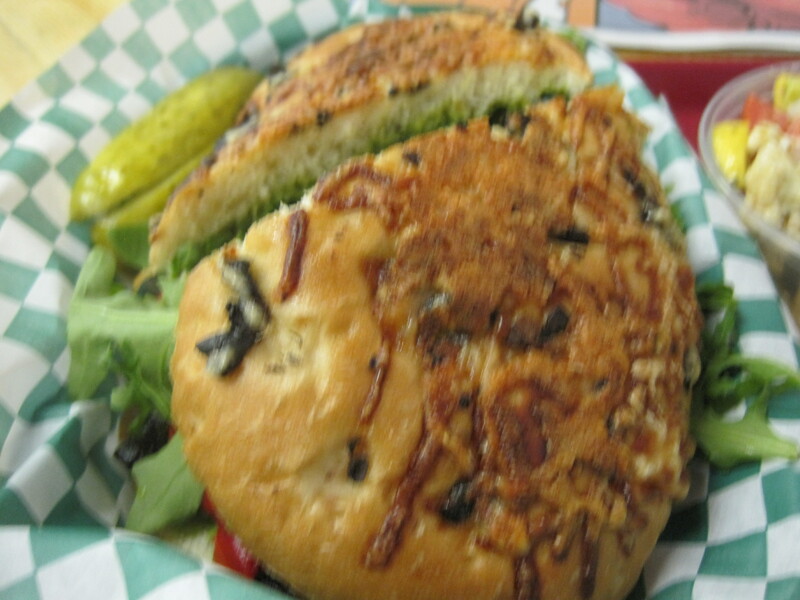 And if burgers aren’t your style, this small eatery does a lot with things like falafel and hummus. 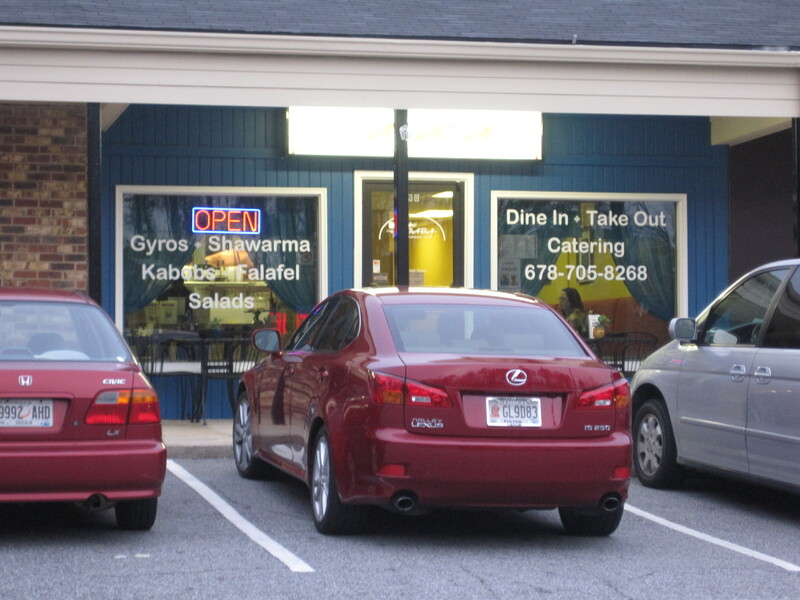 They have a schwarma plate and they do kabobs with a wide variety of meats. For those interested in these kinds of things, Chef Tamli caters, and small signs suggesting he could cater for Passover were scattered throughout the small eatery.